Hi, it’s Natasha from The Cake Merchant. Today I’m here to share one of my favorite things — dessert shooters. After I’ve had my fill of Halloween candy and pumpkin pie this season, all I need is a few small bites to satisfy my sweet tooth until Christmas comes around. 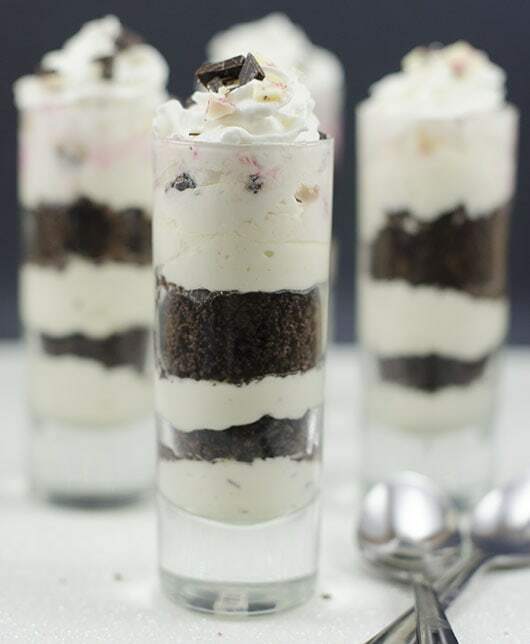 These cheesecake shooters were inspired by the Peppermint Bark Cheesecake at the Cheesecake Factory. I presented my miniature version in 2.5 oz. shot glasses, but any small container will do. Crush the graham crackers into crumbs. I did this by putting the graham crackers in a Ziploc bag and crushed them with a rolling pin, but you could also do this with a food processor. Mix the graham cracker crumbs with the melted butter and set aside. With an electric mixer, beat the heavy cream until stiff peaks form. Set aside. With an electric mixer, beat the cream cheese, sugar, vanilla extract, and peppermint extract until smooth. Gently stir in the whipped cream until combined. Set aside about 2 tablespoons of the peppermint bark and stir the rest into the cream cheese mixture. Put the cream cheese mixture into a decorating bag fitted with a large round pastry tip. Alternate layering the graham cracker crumbs and the cream cheese mixture into the shot glasses. 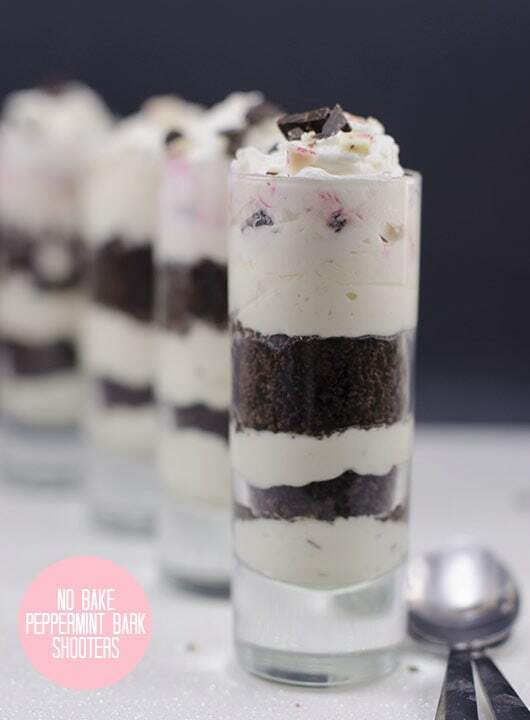 Finish by piping some Reddi-Wip onto the top of each shot glass and topping with additional peppermint bark for garnish. These looks amazing! So cute and delicious! Thanks Julia! The Cake Merchant sure is a talented one.